will celebrate its third birthday this coming January. But instead of crafting an elaborate celebration for their creation, Buick engineers are hard at work developing a new facelifted version of the compact crossover. Seen above, the facelifted version was recently caught undergoing testing in Southern Europe. As you can see, Buick was careful to wrap its creation in camouflage in a bid to hide its identity from curious camera phones. 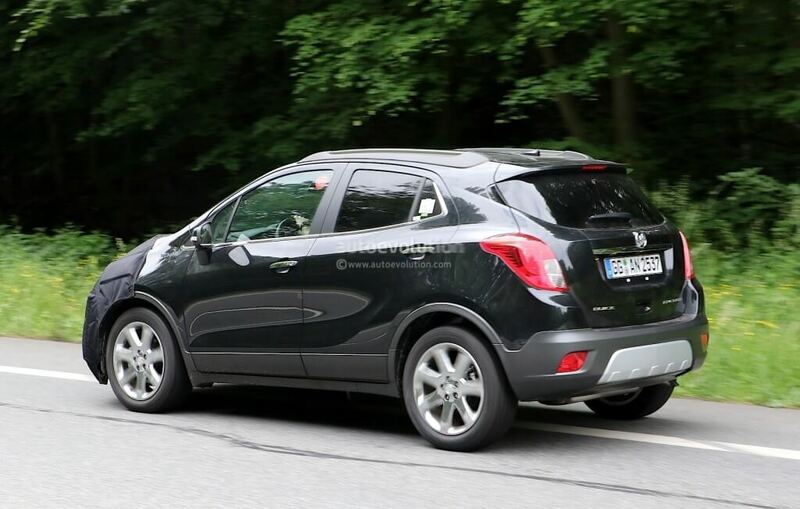 While it’s hard to tell exactly what’s going on under the black cladding, it appears the new Encore will wear a revised front fascia set off with a slimmer grill and enlarged the air intakes. There doesn’t appear to any other modifications elsewhere, but that could definitely change by the time the revised Encore hits the market. Speaking of which, we don’t have a clear time frame as to when the model might go on sale, but it wouldn’t surprise us to see it on the road in late 2016 or early 2017. It remains to be seen whether Buick will update modify the engine in the Encore. With that said, we’ve big fans of the peppy, turbocharged 1.4L inline-four cylinder (138 hp and 148lb-ft of torque) found under the hood of the current model. Stay tuned for more on the upcoming, revised Buck Encore.